Viv's cousin Wally, a symphony percussionist, comes to visit when he has been hired to play with a big New York City orchestra. He is so nervous about the upcoming concert that to relax the high-strung man, Lucy hypnotizes him into a deep sleep. She does so well that she can't wake him up, and now must take Wally's place as the cymbalist for the orchestra. She is so horrible, she runs off the conductor mid-performance. Once Lucy picks up the baton, she can't help help herself. Special Notes: The bulk of the show features Lucy in pantomime as Harold's concert replacement. Vivian's cousin was originally named Harold Tuttle, but during rehearsals was changed to Wally. The closing credits still credit Wally Cox as Harold Tuttle. 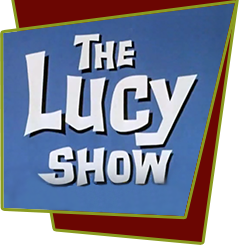 Jack Donohue, who plays the symphony conductor, is The Lucy Show's Director. Bloopers: When describing the mishap at the symphony where the percussionist slams his nose between the cymbals, Vivian Vance uses the word "credenza" when referring to a musical performance. A credenza is an item of furniture. She means "cadenza".